Chainfuel Product Updates: Anti-Spam, Welcome Messages, Pay With Crypto, and more! Chainfuel for Telegram's product updates include a bunch of new features to help you streamline and automate your Telegram Community Management. Happy to report back with another weekly product update from Chainfuel! For those of you not familiar, Chainfuel is a Telegram management tool for crypto startups. Chainfuel Free offers Telegram analytics, spam blocking, and CRM for Telegram groups, 100% free: get started here. 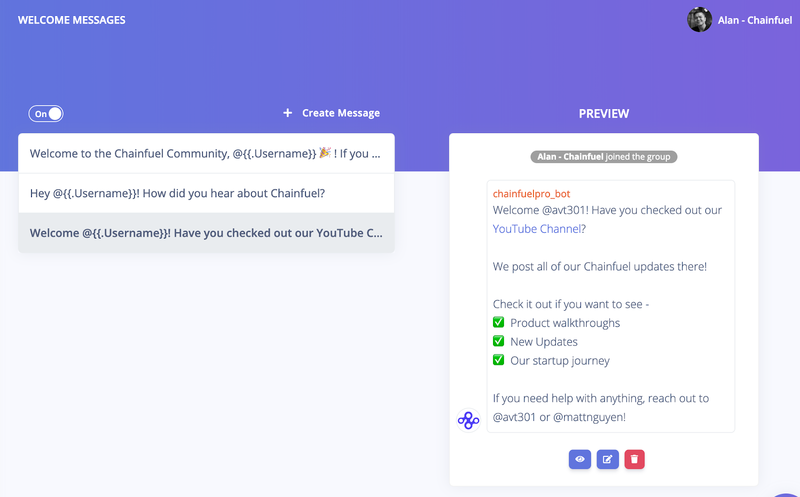 Chainfuel PRO is our premium Telegram community management automation tool, offering advanced insights, CRM, scheduled messages, welcome messages, surveys/polls, custom branded bots, and more. Lear more and get started here. As a Telegram Admin, one of your most important jobs is keeping your community members safe from spammers, scammers, and trolls trying to screw your community memebers over. With our new updates in anti-spam, your group will be free from a lot of the lower-level spam techniques that are prevelent throughout Telegram today. Our anti-spam updates include updates to Chainfuel’s Anti-Spam Alogirthm, General Group Rules, Global Messaging Restrictions, New Member Restrictions, and Language & Bot Restrictions. 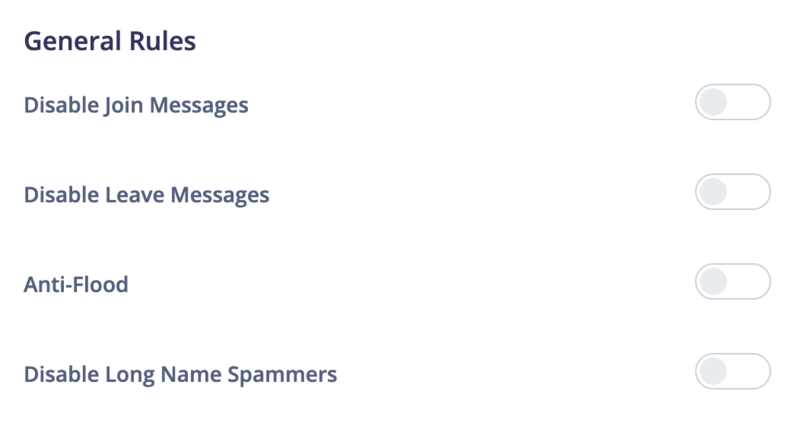 We’ve implemented the first iteration of the Chainfuel Anti-Spam Algorithm, which identifies common types of spam across all of our customer’s Telegram Communities, and blocks messages and users our system flags as spam. Over time, this algorithm, will get smarter as our users (like you!) flag spam through Chainfuel, keeping the algorithm up to date with the latest Telegram spam techniques so we can ensure spam-free communities for our customers. Disable Join & Leave Messages = Automatically removing those little updates in the group whenever users join or leave a group. This is useful for groups that are growing at a rapid pace, so you can avoid having your group flooded with unnecessary and annoying join/leave messages. Anti-Flood = Automatically deleting messages when a user posts too many times in a short time frame. Good for stopping trolls and spammers from taking over the conversation in your Telegram Group. In particular, Forwarded Messages and Documents are commonly used by spammers, so turning off these types of messages will stop a lot of low-level spam in its tracks. 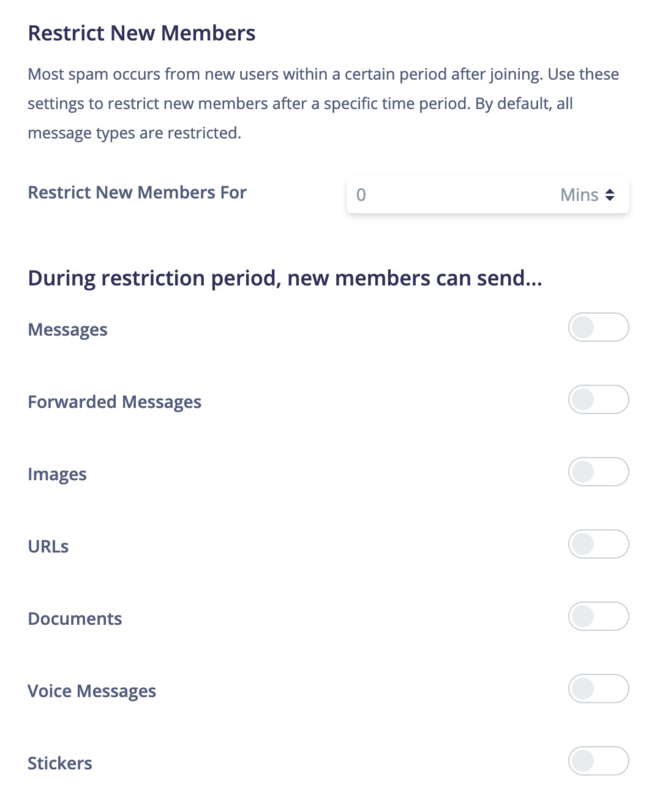 With New Member restrictions, you can restrict new members from posting certain kinds of content in the group for a specific amount of time. This is a great way for you to block new people from joining your group and immediately spamming with Documents, Forwarded Messages, or any of the listed message types, while allowing older members to post that message type later. Language Blacklist = Automatically delete messages with offensive language or any other language you wish to prohibit. 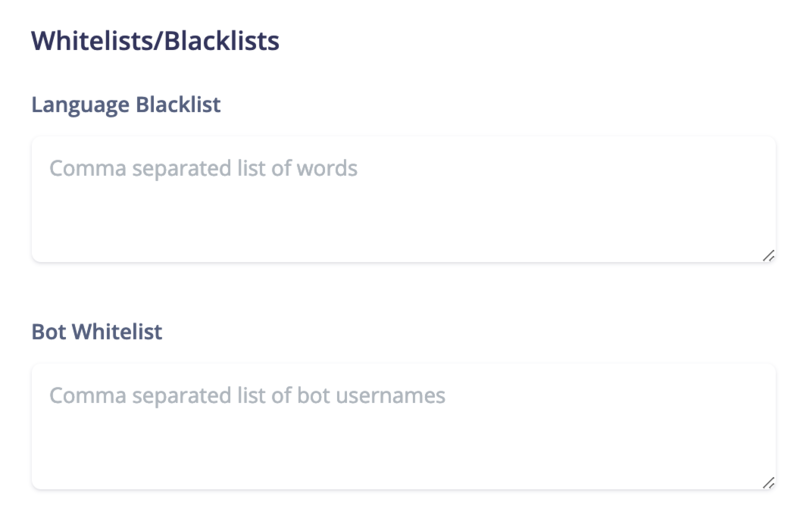 Simply upload a list of prohibited words separated by commas, and the Chainfuel Bot will automatically delete every message containing any of the probhited words. One of your primary jobs as a Telegram Admin is creating a welcoming environment for new community members, so they feel welcome to engage and participate in the conversation. With our new Welcome Messages feature, you can set up a queue of different Welcome Messages that the system will cycle through, posting a new message when new members join your Telegram. You can use the merge field to welcome users by name, and then point them to helpful content, relevant links/resources, your community managers, or your community rules. Welcome Messages is the first of many powerful new engagement tools to come, which will help you by streamlining and automating as much of your role as a community manager as possible, so you can focus on high-level responsibilities. 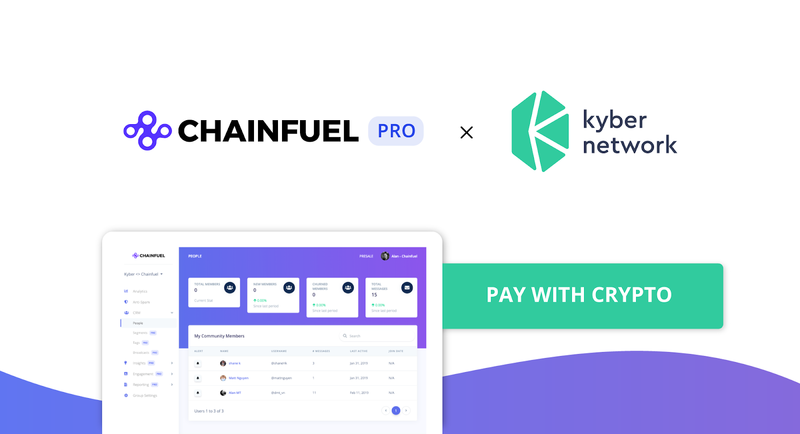 As we mentioned in our recent blog post, we have integrated the KyberWidget to accept a wide range of ERC20 payments for Chainfuel PRO - our premium Telegram Community Management Automation platform. With this integration, we aim to signal our commitment and belief in the future of the crypto and blockchain ecosystem, while expanding the payment options and increasing the accessibility of our products for our customers in the crypto space. Read the announcement here to learn more! Last but not least - a quick sneak peak. We’re putting the finishing touches on Scheduled Messages! 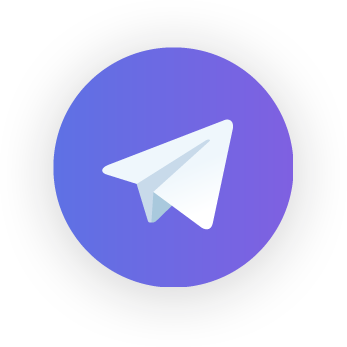 As a Telegram Admin, you’re responsible for keeping your community up to date with the latest news, announcements, and resources from your project or business. Every time there’s a new update, you need to post it in the community, and ideally, you post it repeatedly over the course of a few days or weeks (to drive as much awareness about the update as possible). Before Scheduled Messages, you had to do this manually. Now, you can schedule messages to go out in advance, and make them repeat over a calendar period so you can set it up once and forget about it going forward! We launched our Chainfuel YouTube Channel! Subscribe for helpful tutorials, community growth/management resources, product updates, and more! We launched Chainfuel on Product Hunt and ended the day at #4 with over 450 upvotes! That’s all for now! As always, we invite you to follow along and join us in our Telegram Community, where we’re building Chainfuel in the open with your feedback and input. You can find myself and Matt in the group, and let us know if you have any questions. Oh yeah, and if you haven’t already, sign up for Chainfuel to get going with our (100% free!) Telegram Analytics and Anti-Spam solution!